I thought it would be interesting to look at the math achievement data that district leadership reviewed, in detail, before recommending our math placement policy. I should note that the data is from the California Standards Test (CST), which has now been discontinued in favor of the Common Core-aligned Smarter Balanced Assessments (SBAC). You cannot compare SBAC results to CST results, because they are very different assessments. So, while we do have one base year of SBAC scores, I’m only using CSTs here because of the comparability issues. That’s why there are no scores past 2013 — the state stopped administering CSTs after 2013 and did not administer SBACs until 2015. ENROLLMENT: The graph below shows the percentage of students in each grade who took each version of the California Standards Test. 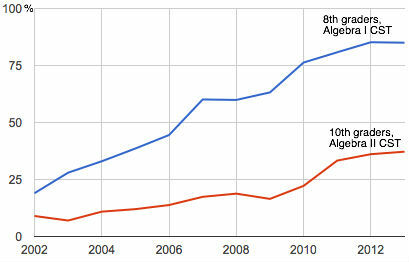 This graph documents the overall trend in the 2000s towards more students taking Algebra I in 8th grade, which in turn increased the number of students taking Algebra II in 10th grade. PERFORMANCE: More students took these courses earlier in middle and high school than previously, but how did they perform? Perhaps not surprisingly, as more students took these courses, that were previously considered to be very advanced, performance gradually declined. The next graph shows the percentage of students in each grade who took each test and scored advanced or proficient. 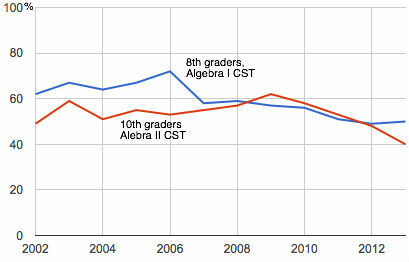 I find it troubling that achievement in Algebra I, as demonstrated by the CST anyway, clearly flattened out at under 50 percent scoring advanced or proficient in recent years. And Algebra II scores — remember, by 10th graders, who would most likely have to have been placed in Algebra I two years earlier to take Algebra II in 8th grade — show an even sharper decline. The last graph is a different perspective on the size of the cohort of students scoring advanced or proficient on each state test. Instead of basing the percentage on the universe of students who took the test, as in the graph above, I calculated students in each grade scoring advanced or proficient on each test as a percentage of their entire class cohort — not just those who took the test. If you accept that these CST scores are a reasonable proxy for mastery of the subject (and there are arguments about that), you can see that indeed we had little to brag about in terms of math proficiency in secondary school. The Algebra II CST scores are particularly dismal — just 14 percent of all 10th graders (and 40 percent of those who took the course) scored advanced or proficient in Algebra II in 2013. I have shared the underlying data for these charts in a Google Doc which you may view if you’re interested. That data and much more is also available here, from the California Department of Education. What the data tells me is that we really did/do need to overhaul math instruction to improve achievement in Algebra and other advanced math topics. In my view, reasonable people can disagree on the district’s chosen course for math policy, but it’s not an unreasonable assumption that giving students time to develop a firmer foundation in math — particularly as the rigor of the Algebra courses most students will encounter under the Common Core has increased dramatically — is a good idea if we want to improve achievement and get more students to attain higher levels of mathematics. Anyway, Algebra II is a basic gatekeeper to the future: you cannot go to a four-year college as an 18-year-old if you cannot pass it. And even good “vocational” careers requiring apprenticeships rather than college degrees (like being a union carpenter, for example) require this level of math mastery. I’ve been hearing a lot from the parents who are concerned their children need to move at a faster pace. I would like all of us to pause for just a moment and contemplate how many students’ futures have been curtailed because our system has not prepared many students very well for the math they need in the future. That said, I am continuing to have a dialogue with parents and with district leaders about how we can continue to improve our Common Core implementation: I’m particularly interested in additional class size reduction in middle school math, because I believe teachers need that space to fully realize the paradigm shift that Common Core represents. I’m also really inspired by some great conversations that are starting around redesigning high school, which is another pillar of the district’s Vision 2025. By deepening and extending our relationship with City College, for example, we can expand the acceleration options available to students, while allowing much more flexibility around where (and when) students take courses. This entry was posted in BOE, Improving schools, issues and tagged common core, math. Bookmark the permalink. The District is applauded for its efforts to help students who struggle with math; however, more needs to be done to accelerate the math curriculum for students with a penchant for math (BTW both of my children struggle with math, thus my comments on this topic are not self serving). In Minnesota, students in grades 6-12 can enroll in UMTYMP–University of Minnesota Talented Youth Mathematics Program. UMTYMP (pronounced “um-tee-ump”) is an accelerated program for students who are highly talented in mathematics. Although there are many math programs throughout the country, UMTYMP is unique in terms of the number of students, length of the program, scope of the curriculum, and the granting of honors level college credit to students in middle school and high school. You can read more about UMTYMP at http://mathcep.umn.edu/umtymp/. Wayzata High School is a comprehensive public school in the suburbs of Minneapolis serving ~3300 students (http://www.wayzata.k12.mn.us/Page/29). Their website explains how students get access to an accelerated math curriculum. There were 848 freshman in the class of 2017, with 438 freshman (52%) taking honors classes: 165 in 1 honors class; 125 in 2 honors classes; 85 in 3 honors classes; and 63 in 4+ honors classes. Fourteen freshman were taking 1 or more AP math classes (11 in UMTYMP; 4 in AP calc AB/calc BC; 2 in AP statistics; 2 in AP computer science), 5 freshman were taking AP macroeconomics; and 6 freshman were taking AP microeconomics. The school offers a course in Linear Algebra and Differential Equations, which follows AP calc BC, and all students can accelerate their math sequence to take this course in their senior year. It would be wonderful if middle schools and high schools in SFUSD offered the option of an accelerated math curriculum. Students should not be required to travel offsite (for example City College) or spend their own money (for example online courses) to supplement their math education. The District’s mandatory sequence of math courses is very disappointing considering our proximity to the epicenter of technology (Bay Area biotechnology and Silicon Valley), scientific disciplines that rely heavily on advanced mathematics. To be quite honest, it makes sense that results went down. We went from having a select group of people taking algebra to almost everyone. It’s only right that we would see a drop in test scores. It seems like SFUSD went to far one way and is going to far the other way now. Finding qualified teachers to teach algebra 1 in middle school should not be too difficult. Up until 2 years ago, the teachers at our middle school were teaching algebra 1. Then CCSS math 8 fell from the heavens, and we have been watching the struggles in the classroom as students and staff wrestle with inadequate materials and improper district-wide implementation. I would imagine that there are some wonderful legacy algebra 1 teachers in the district who would welcome the opportunity to teach 8th grade algebra 1 again. Only this time, they would be teaching highly motivated middle school students who are taking the subject because they want to take it, and their pace would not be encumbered by disinterested or unprepared students who are sitting in the classroom because the District mandated it. Those latter students could take CCSS Math 8 and proceed to algebra 1 in 9th grade. The District seems to be doing everything in its power to chase away high-achieving middle school students–no honors classes and no algebra 1. Is the District lessening the achievement gap by merely shooing away the bright kids? Chopping off the top will certainly give the illusion of lessening the gap. Thank you for your work. In terms of re-imagining high school, here are a few ideas that I would like to suggest based on my reading of Mission High. 1. Reduce teacher class load so teachers have more time to prepare for classes, assess student work, and spend more time on collaborative teaching methods. 2. Raise teacher pay so that all teachers working in SFUSD can live in San Francisco and pay off any student loans which are associated with their education. 3. Provide time and money for teacher development and collaborative work. 4. Ask teachers for their professional input when it comes to curriculum design and other structural issues. This blog post is about math curriculum but I do not see any comments from teachers. Mission High shows how hyper-local programs from the ground up are very effective. 5. Reduce class sizes so teachers can provide individual and differentiated learning. 6. Start a mentor program where experienced teachers work with new teachers for at least two years. This would provide a great education for the new teacher and professional assistance in the classroom for the experienced teacher. This would help with differentiated learning. I think the most radical change in public schools today would be paying competitive wages, including teachers as an equal voice in curriculum and policy changes, reducing course loads, and creating mentorship programs which are two to three years long. All school board members and community activist should be trying to get more funding for our public schools through Prop. 13 reform. Despite our immense wealth, California’s funding is in the bottom 20% nationally. Curriculum is one issue but we need experienced, well-paid public school teachers to lead our classrooms. We will not be able to hire and retain teachers if their pay and working conditions are not competitive with other forms of employment. Most new teachers have student loan debt and their starting wages are extremely low, compared with other, less demanding jobs. Let’s re-imagine high school with well-paid, supported teachers, smaller classes, and truly differentiated learning. Missy Sue is correct that we should allow kids who are ready (or who think they are ready) to take Algebra 1 in Middle School. She points out that the increase in students taking Algebra 1 in 8th grade increased the sucessrate of kids who were proficient in Algebra 2. One of the hardest challenges in staffing Middle Schools is to get enough very strong math teachers to want to teach that age, those cute but squirmy 8th graders. Finding strong teachers for “Math 8 for all” is also hard. With your well intentioned “smaller class size” proposal, that just means you need to find even more good, strong math teachers who would choose Middle school. That is especially tough at Hard to Staff.schools. As a Math teacher, I think “Algebra 2 for all” is a mistake. Actually the class after Geometry should probably be a choice of Computer programming OR Algebra 2, or both for kids who want a bigger challenge. UC Berkeley needs to update their A-G requirements to address this issue. Programming is much more valuable, even in STEM fields, than Algebra 2 topics. Who really uses Matrix Algebra, Exponential functions, or Logarithms regularly? And yet, most professions these days require computer use – from spread sheet formulas to programming graphic calculators, etc. SFUSD’s policy should be to let the 8th graders voluntarily “Opt in” to Algebra 1. The kids who want that challenge will be motivated to work hard. The ones who don’t opt in, could benefit from a smaller class size in Math 8. The Algebra teachers would have a challenge, but no worse than the challenge they had with the old push to try to get 8th grade Algebra 1 for all – and no worse than the problem of the huge range of needs in a “Math8 for all” class that schools currently have. Let the kids and their parents have a choice to take Algebra 1 in 8th grade – All other CA public school districts give kids a chance to take Alg 1 in 8th grade – even Oakland. Not allowing that choice makes our SF kids less competitive and that is not really fair. Ruchi: I so agree with everything you said except for Geometry. I know the proofs seem tedious. I hated it. My son hated it. But it’s important. It is part of the scientific process. It teaches kids how to critically think and lay out arguments. You can’t just accept something, you need to understand why something is. And it is vitally important for science too. He’s starting to realize this in his AP Physics class. You need Geometry for advanced physics. It’s also important in the second half of Algebra 2 which has trigonometry in it. When I was in high school it was called Algebra & Trig. 30 odd years later they call it Algebra 2. When I was in college especially, in some of my Electrical Engineering classes (transmission lines, I’m looking at you), I saw value in all those painful geometry classes. And this brings me back to your point about compressing Algebra 2 and Pre Calculus. I think compressing at this level is a huge disservice. Not to mention that compression course might not meet the AP BC Calculus requirements. (there are two AP Math calculus classes available. AB and the more rigorous BC). The problem with delaying Common Core Algebra 1 for qualified students is it also delays science for STEM interested students. Here is an anecdotal story. My son in 10th grade is able to take an Algebra based Physics course (AP Physics 1. He has a high B in it right now. My daughter would not be able to take that same class until 11th grade because it requires Algebra 2 (prior or taken concurrently). Our surrounding districts (Cupertino was mentioned in this edsource article : http://edsource.org/2015/districts-must-ensure-equity-in-rules-for-accelerating-students-in-math ) allow a pathway to complete CCSS Algebra 1 by 8th grade. It is a red herring to claim that because the common core standards have changed that students aren’t able to take CCSS Algebra 1 in 8th grade. They are. The common core standards recommend the qualified students be able to do in Middle School even. The surrounding districts who are all common core allow it. Our STEM bound SFUSD students will be competing with said surrounding districts for UC seats. And because most of our surround districts allow a pathway for their students to Common Core Algebra 1 in middle school? They have the opportunity to take the aforementioned advance science courses earlier than ours. Why does that matter? Because it makes them more competitive than SFUSD students for UC STEM admission. The SFUSD has also acknowledged they will allow private school students who have had Common Core Algebra 1 to take the validation test. However, that said? Most do not want their child to skip a class. I do not want my child taking a validation test if she hasn’t had the class. However as Cupertino, Oakland and other districts demonstrate ,there is indeed a pathway to complete Common Core Algebra 1 by the end of the 8th grade. And it is far more equitable than the current SFUSD solution. As it stands now the SFUSD has created a haves and have not pathway. I’ve finally understood the requirement to transfer a CCSS Algebra 1 class to high school this fall. Apex Learning (apexlearning.com) is an accredited on-line *high school* that is also accepted by UC. This is why the district has to accept the Algebra 1 common core class from this place. It both meets the UC a-g and it’s an accredited high school. SFUSD accepts transfers from private high schools and out of state students from accredited high schools. Apex Learning is no different. So if one is looking for a CCSS Algebra 1 course (or anything else) make sure the on-line class is from an accredited high school and approved on UC Doorways. Meanwhile? Those of us who can afford to pay $700 for the Common Core Algebra 1 class can (and will) do so. I can pay for this. My daughter will take it prior to entering the 9th grade next year. The socioeconomically disadvantaged child sitting next to her will have to double up or take the compressed course. If the socioeconomically disadvantaged child doubles up (which is what I’d recommend as it would get the child to Algebra 2 in 10th grade so he/she can take a, for example, Algebra based Physics class) that child fills up a slot that could be used to take a language or other graduation requirement. My child takes Geometry, History, Biology, Language, English and PE. The other child takes Geometry, Algebra 1, History, Biology, English and PE. My daughter has the advantage, she has a year head start in finishing one of the a-g requirements. This policy by the SFUSD is, I firmly believe, going to end up hurting the very students they are trying to help. The socioeconomically disadvantaged. All this reminds of the enrollment debates and how in trying to help desegregate the schools, instead it’s more so than it has ever been. I expect to hear the same mea culpa from the board around the Math sequence implementation as I’ve heard around the the lottery process. I’ll say it again. I love the SFUSD. I love our experience. I am pro common core and differentiation. I take great issue however with how this math sequence is being implemented. I can pay my way out of this box and I am going to. Others are not so fortunate. Mark my words. This will be the legacy of this sequence implementation. Thank you so much for all this data, but I actually think this data presents clear evidence for keeping Algebra I as an option in 8th grade. From 2002-2013, enrollment in Algebra I TRIPLED and in that time period, you see a commensurate increase in overall 8th grade math proficiency. With regards to Algebra II, I completely agree with you on the importance of Algebra II which is why I find the decision by SFUSD to compress Algebra II in order for students to get to Calculus by 12th grade utterly baffling. Why would you compress such a vitally important course? I do agree though that redesigning the high school math curriculum is important, and probably the changes to middle school curriculum should not have been rolled out until changes to the high school curriculum were further thought through. To me, the compression of Algebra II/Precalculus is a half-baked mechanism for still offering students the possibility of Calculus in 12th grade (though with only half a year to complete Algebra II, how many of those students will be adequately prepared for Calculus?) On the other hand, as much as I adored high school geometry (proofs! ), I find its utility in the 21st century fairly limited compared to statistics. A fully thought through re-imagining of the high school math curriculum might have engendered more support for the middle school curriculum changes. parents are hung up on their kids not getting the same algebra as they had, or at least as it was labeled. Thank you, Rachel, for sharing this perspective. Looking beyond math, the time is ripe for SFUSD and CCSF to make more college classes available to high school students. Recently passed and signed CA AB 288 expands opportunities for duel enrollment programs. High school students who are ready for advanced courses should have access to real college credits, which are much more valuable than AP test scores. I’m also concerned about the quality of vocational programs. SFUSD’s commitment to “career ready” education must not be like the bad old days of dead-end classes leading to low-skill, low-wage jobs. Frankly, I have more confidence in the ability of community colleges and unions to provide vocational training than high schools. We can learn from other districts’ programs, as well as leverage our unique assets. In Pasadena (home of Assemblymember Holden, co-author of AB 288), four high schools offer Pasadena Community College classes taught on their high school campus. In San Francisco, most students already live or go to school near one of CCSF’s eleven CCSF existing campuses. For both academic and vocational programs, CCSF already offers a much wider array of classes than SFUSD could develop on its own. Thank you, Ms. Norton, for sharing with us some of the thinking behind recent policy changes. I really appreciate your communicating through this blog. In regards to this data, your third graph seems to indicate (and your Google Doc quantifies) that having increased access to Algebra 1 in middle school more than tripled the number of students leaving 8th grade proficient in math. Clearly there is a large segment of the population that benefits from Algebra in middle school, even if it is not everyone. How can such data result in a decision to remove ALL Algebra from middle school? It seems to be taken as automatic that the reason for such a large percentage of students NOT succeeding in 8th grade Algebra is that there is some problem with the curriculum. Can we take a look at the data of how many of the 8th graders were pushed into Algebra before they were ready? With 85% of 8th graders taking Algebra, that probably includes a great many students who weren’t ready. This district has tried two distinct policies so far: Algebra 1 for all 8th graders and, more recently, Algebra 1 for no 8th graders. What is wrong with both of these policies is that neither takes into consideration the needs of the student. You are either ready for an Algebra course, or you are not. Differentiation is not the answer for attempting to teach Algebra to students who are not ready for it. It diminishes what can be taught for the students who are ready and unfairly challenges those who are not – that is just common sense. And to put to rest the notion that there was something wrong with the curriculum or old course pathways, Lowell High School scored 85% proficient on the Smarter Balanced Assessment last year, which is supposed to assess Common Core Standards. That number is pretty much the same as Lowell’s performance in previous years when the CST was the standardized test. But the majority of Lowell’s 11th graders who took the Smarter Balanced Assessment were already in Precalculus courses in this first year of CC (Precalculus is not part of the Common Core), and thus had absolutely NO Common Core implementation! Lowell’s standard, traditional curriculum prepared them for the Common Core Standards just as effectively as it had for previous sets of State-wide standards. Keep in mind that now 48% of Lowell’s students are on a free/reduced lunch program. The way I see this data, it is very clear that there are enough students ready for Algebra in 8th grade for it to be offered there. Both the Common Core and the California State Framework recommend having Algebra 1 as an option in middle school, even possibly in 7th grade. The fact that there are many students for whom this is not appropriate doesn’t make it any less appropriate for those who are ready for it. You say that you are looking for ways to improve Common Core implementation; how about creating choices for families and students who want an opportunity to dive deeply into any subject matter, who are motivated to learn already, and just need space to try? And for the people who say that the new Common Core Algebra 1 is “more rigorous” than previous math courses, then why does it still take three years to go from the end of Algebra 1 to the beginning of Calculus, the same as the traditional curriculum? There are still 3 years worth of math (Geometry, Algebra 2, and Precalculus) standing in between Algebra and Calculus. And if you “compress” the Algebra 2 and Precalculus into one year-long course, something I would never advise, it is still 3 years worth of important math. By delaying Algebra to 9th grade indiscriminately across the board puts unfair obstacles in the path to high school Calculus for those students who need it for admission to STEM majors and elite colleges and universities. Even in those majors where it is not necessary for admission, it is a great advantage to have had some Calculus in high school.